Recently, my mouse died. I’d had it since sometime in 2010. I can’t remember precisely, I just remember that when I got it I was a boomkin/resto druid and we were doing ICC. I had a hard time getting it set up and I had a hard time learning to use it. Yet when it died about two years later, I went right out and bought another one just like it. 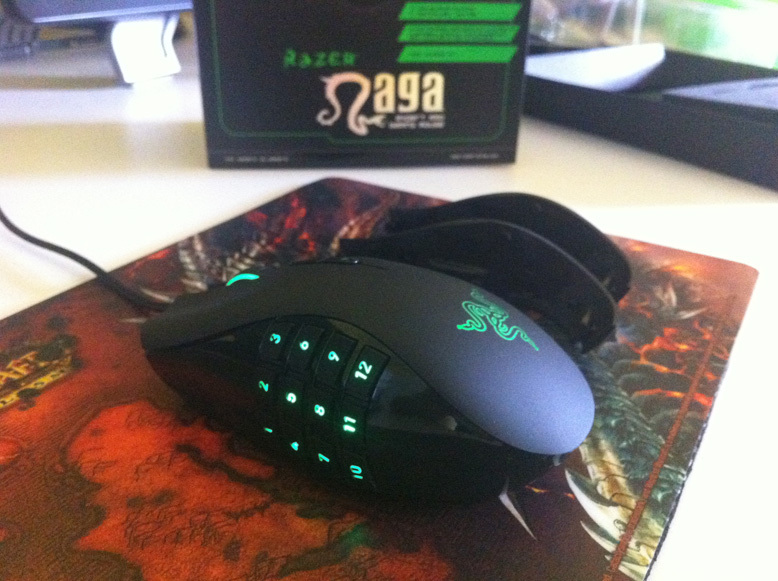 The mouse is the Razer Naga. 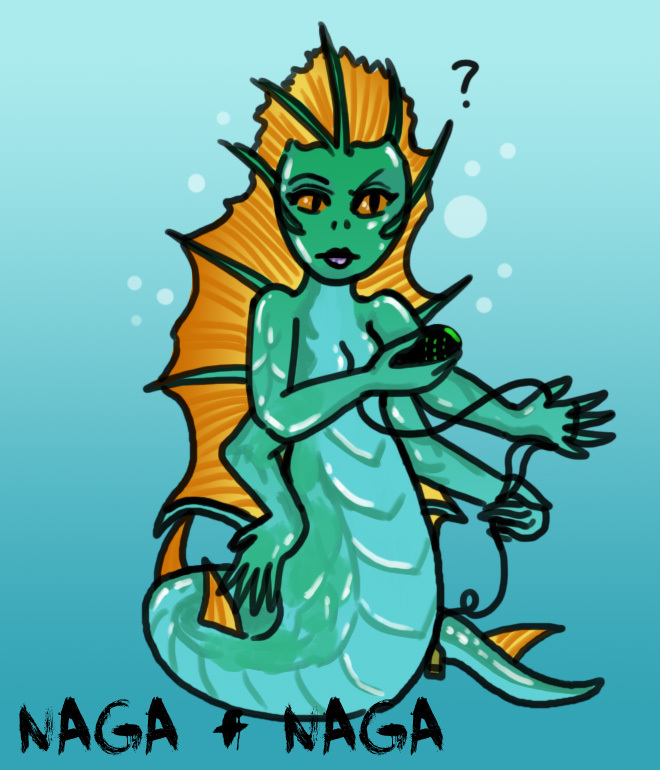 No, not that kind of Naga. Why would I buy the same mouse, you might ask? (And no, this isn’t exactly a product endorsement, I’m definitely not getting paid by Razer). Well, for a few reasons. The first one is that it fits my hand perfectly, which isn’t easy to come by. I find most gaming mice to be too large or unwieldy or simply the wrong shape for my hand. I would go so far as to say that the Naga might be a bit small for the average male hand, but it is exactly the right size for mine. So ergonomics is one strong reason; when you use a mouse really often it matters whether it’s comfortable or not. You see those buttons on the side? 12 side-buttons, the main two buttons, a wheel and two extra buttons ensures that there are a ridiculous number of buttons to press at any time. The Naga is specifically designed for MMOs and maximum button access. The way that the Naga is able to achieve so many extra buttons on a mouse is by making them correspond with buttons on a keyboard. There’s a slider on the bottom of the mouse that lets you determine whether you want buttons 1-12 to match the number keys at the top of your keyboard, or the number pad on the side. I choose to use the numpad, because I don’t use it for anything else otherwise, and I still need access to my nuke keys at the top. I’m going to let you have a rare look at my UI so I can explain more readily how that works out in-game. Don’t judge my really messy bars – there are duplicates, there are random things, but all the important things are within reach. There is a reason for the placement of most of these abilities. All of the abilities I’d want to be spamming are kept on the keyboard. Primarily Fireball in position two and Pyroblast right alongside. What I find the Naga really excels at are abilities that are either instant, or that require placement. So for example using the Naga for Flamestrike or Blast Wave is really fast and intuitive, because I can be hitting the key and already moving my cursor into position to place the reticule. This would also apply for Blizzard, when I happen to be playing Frost. I keep my Counterspell in a really easy to hit position for ease of use. My assist macro doesn’t really NEED to be on the Naga but I find it convenient for it to be. Scorch also occupies a position in the first row of buttons so I can cast all the scorches while moving. I also use the same set-up for my healing characters. Here’s a glimpse at how that plays out. As a healer, I tend to favour all of my healing abilities being on my mouse in one way or another. Here you can see I’ve set up mouseover macros for all of my castable abilities: Holy Shock, Flash of Light, Word of Glory. Light of Dawn is over at button three because it’s a moving/situational ability anyway so it’s easier to hit three after I’ve maneuvered to cast it. Next on the Naga comes Rebuke, a few of the Hand spells, bubble, Aura Mastery, healing cooldowns, and a warlock cookie. (I’m ashamed to admit that I can’t remember what paladin cooldown is called, but hey I’m not a paladin blogger! I’m pretty sure it’s something either divine, holy, or Handsy). The rest of my healing abilities depend on simple key clicks via Vuhdo (e.g. left click is “bread and butter moderate cast/mana heal,” the right one is “longer cast time heavier mana/oomph heal.”) My dispel abilities are likewise “hidden” in this UI because they are variations of CTRL + clicks or SHIFT + clicks. Although my method tends to be a bit haphazard, it works for me! It’s pretty evident why I’d be reluctant to give up the mouse now that I’ve been accustomed to it for two years. I’ve always struggled to use the far right portion of the keyboard, although I do use some other buttons in other places. (Note that “Blink” is bound to F, so it’s never far from any of my standard WASD keys). I also use Button 4 and Button 5 (on a standard mouse, these are usually the side buttons while Button 3 is the click wheel). B4 is my mount button and B5 is Spellsteal. This has been one major drawback of the new Naga – these buttons have switched positions. This is really messing with my head at the moment. Although I understand why the buttons were moved – on the first generation mouse they were hard to reach and it took me a long time to get used to them at all – now they are right underneath where I’m used to letting my hand rest and I really have to think about how to reach them. I don’t tend to use the “click” feature on the mouse wheel for the same reason, but currently I have it set up through Vuhdo to cast Slowfall on myself or others. The newest Naga has another feature that wasn’t present on my old one: adjustable side-plates. You can see them fairly well here. From what I can tell, a magnet holds the plate onto the mouse itself, so you can just pull one off and pop a new one on. 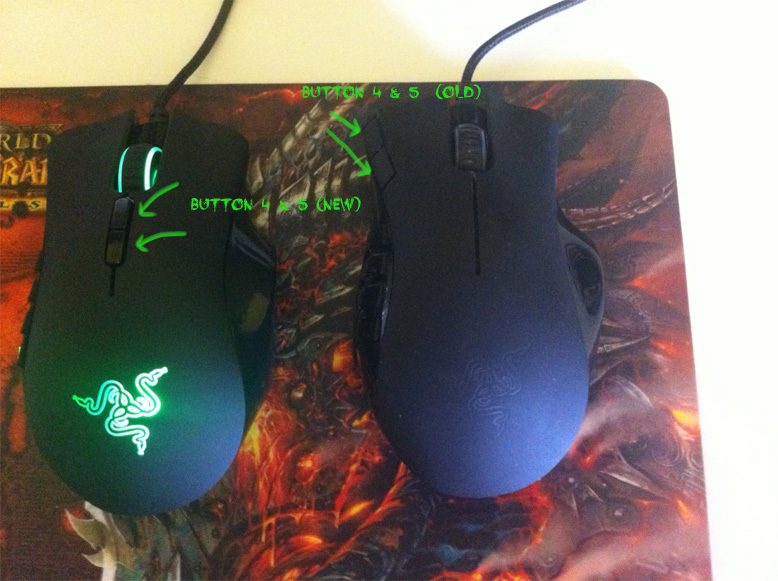 I am using the one that’s most like the old Naga (why fix it if it ain’t broke) but it comes with two other sizes, one of which seems fairly wide and might help to alleviate size issues for folks who find the mouse doesn’t fit their hand properly. I was concerned initially that the side plate might be prone to just pop off, but so far that hasn’t happened. I’m generally happy with the new Naga. Most importantly, after I installed the drivers it worked perfectly with my existing WoW set-up. Here are some Naga pros and cons for you. 1) Mandatory registration via the Razer website: The idea is that this “Synapse” system of theirs will save your mouse settings and sync them if you’re on a different computer, like at a LAN party or a gaming tournament. That’s not really the kind of thing I do so the registration was a bit annoying. I saw a reviewer comment that it was a deal breaker for him and he wanted to return his mouse, which seems a bit over the top to me. It takes five minutes and is just one in a long list of things I’ve had to sign up for but didn’t really want to. 3) Adjustment period: For a new person getting the Naga, there IS a period of time during which none of those buttons will mean squat to you. You can’t just take it out of the box and begin to play with it, it has a learning curve, and for some people that may be a major drawback. The mouse does come with tiny little “training” stickers that you can place on the buttons to help your thumb get its bearings. I never used these, and after a certain number of hours of gameplay they weren’t necessary. They are there if you need them, but if the idea of learning HOW to use a peripheral doesn’t appeal to you, you may not like the Naga. I would urge you to persevere with it if you want to try it though! It’s definitely been worth it for me. 4) Cost: At $79.99 (Canadian) it’s not exactly cheap. The fancier version, the Razer Naga Epic carries a whopping $129.99 price tag for its wireless capability and colour changing backlighting. Not worth it for my needs but it’s pretty snazzy. 1) Ergonomics: I find the shape of the mouse to be exactly ideal for me. The new adjustable sides make it so you can potentially change between three configurations and find one that suits you best. For hours of gaming, you want a mouse that will support your hand and not cause any strain. 2) Buttons: The Naga’s side buttons are fantastic and I love them. I honestly think I would be really frustrated if I had to play with a “normal” mouse that lacked them, now. They are a Must Have, so I guess Razer has snagged me for as long as I require a gaming mouse. 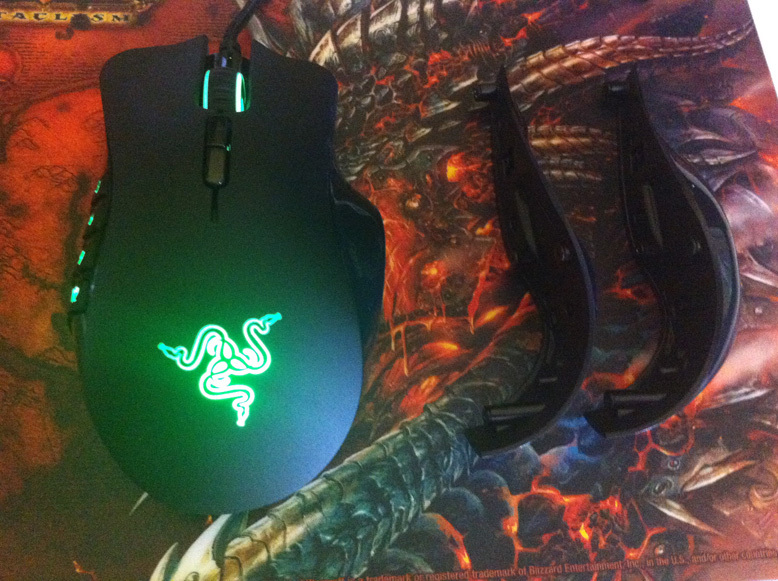 3) Style: The Razer products all look pretty cool, if that matters to you. I am a bit sad because my previous one had blue backlighting (matched my keyboard and tower) and this one is green so it’s odd-man out, but nobody notices that stuff besides me anyway. There are fewer “pros” written here than cons, but for me the pros are pretty big ones. I hope this Naga will last me more than two years this time, but even if it doesn’t and I am still playing MMOs, I will probably be likely to buy another.